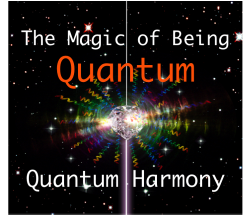 The Magic of Being ﻿﻿Q﻿﻿ua﻿﻿ntum﻿﻿ series. I compare Quantum Harmony to the way instruments work together in an orchestra when we play together using the same key we can produce music that is pleasurable to hear. Playing out of tune can create a discordant sound, which is less desirable. Sometimes we meet energies that may initially feel challenging, I feel this sometimes as a flow that is just too big for my body. This is merely my perception but in energetic terms it just means I am not synchronised or in harmony with another aspect of myself. When I first encountered the Elohim of Creation, in particular Sananda, I found it challenging to simply ‘be’ with the flow of their energy. It took many weeks of practice and acceptance before I could be with them quite naturally and easily. Often when we meet such fine energies we may be faced with blocks that need to be acknowledged. For example my block was really about not accepting that I could be part of the energy we call Sananda, I was resisting being a channel for his energy and this created discordant energy within my fields. It brought up all sorts of feelings mostly connected with ‘what will people say?’ based on my upbringing in a Christian society. With Sananda being the energy that flows through Jesus I had a real identity crisis, how could I be Sananda? As soon as I realised that when I connected to Sananda it was through my divine essence (he is in my Quantum Pulse so to speak) I felt the flow of this really amazing energy, such a deep loving connection, it felt like home. So the thing is to be patient, know that you will harmonise with exactly the right energy, in exactly the right moment.